Well, we have something that would make it easy as hell to build a 80% or so replica of the Oblivion rifle. I am not in the prop hobby nor a stickler about perfect accuracy... not that I could be when building Nerf guns, unless I wanted Terra Nova props... unlike airsoft, Nerf just does NOT lend itself to replicating props nor firearms. But the good little Stryfe is slim enough and has a notably AR15-ish general geometry and magwell design. With a little adjustment and some careful PVC it could be decent. From a distance. So there's the lower receiver taken care of. 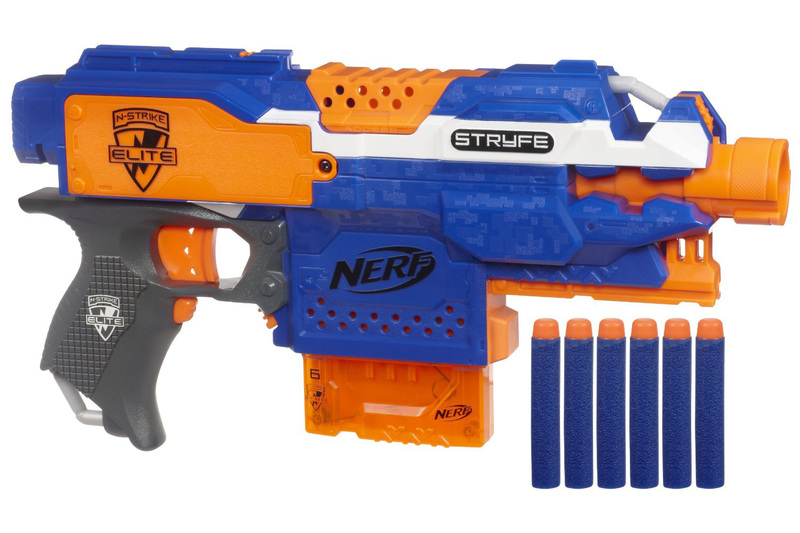 The Stryfe also has some typically troublesome geometry. The top of the receiver is way up there above the barrel - because it's a flywheel gun and that top fly has to go somewhere, doesn't it? That makes most attempts to make an AR replica of a stryfe, IMO, fail. But for this rifle, the shrouds will leave plenty of room for that. There's even a protrusion ahead of the AR lower, where the lower flywheel of my stryfe will need to stick out just slightly. You can see Jack's hand resting on it. Amazing how that stacked up. Finally? The shrouds. Could they get simpler? No difficult detail work. I could bang those out of sheet PVC with a heat gun without too much trouble. Note the shrouds could be formed as pieces of 3 telescoping sizes. Will probably need a wooden form for the base layer, then form the other 2 over each other so everything matches up. Something useful about the Oblivion rifle is that it integrates an LED tactical light inside the shrouds. I will obviously need to have one on this. Also, the optic could be custom'd as a dummy mockup but I might just throw a nitron optic on there and call it good. Planning cade motors and 9 elite 1500 cells internal. It will not be a primary primary, so to speak, but I just might paint it up HvZ safe and use it on zeds. Do you think the Nitron Scope would be a close enough scope to match his gun's? I think it will work for what this is, a nerf prop build. It isn't actually all that close, but it has the right look to the point you would have to look hard to notice the discrepancy. There are bigger fish to fry when it comes to the accuracy of the result here, specifically the vertical position of the pistol grip and the dimensions of the magwell. I may eventually scratchbuild or mod one, but my immediate plan is just to stick with a nitron scope.